The yellow Warp Markers, once moved, stay locked in position. The grey ones move automatically in relation to the Markers that are being moved by the programmer. In part two of our recording and remixing article we examine how you can use Live 's unique features to prepare a recording for remixing. In the last two Live workshops we've looked at how to create an arrangement from the Session View and explored how you can use Live as a more conventional DAW. This month we're going to take things full circle by taking a 'normal' recording and getting it remix-ready. Based on the recording that was the subject of last month's Live workshop, the following methods show how to tighten up (quantise) a recording and use the resulting Clips as the source material for re-arrangement and additional sequencing, as you would for a remix. Live has a very useful feature that allows entire multitrack recordings to be re-quantised with the minimum of fuss. Basically the trick lies in the fact that it is possible to superimpose Warp Markers from one audio Clip on another. For this to work all of your audio files need to be exactly the same length, so before you begin it's necessary to prepare the files you're going to use accordingly. You can define the first beat of the track using this option from the Context Menu. This is a quick way to tidy up the beginning of a recording and set the initial beat that the timing of the track will be based on.The best way to do this is to use the Consolidate function to create new Clips from each of the required audio tracks. It can also be useful for combining all the different Clips and/or drop-ins that make up each track into single Clips, which will make the whole process simpler. Start by highlighting all of the tracks you want to use in the Track Display window and then use the Consolidate function found in the Edit menu (or Apple/Control+J). 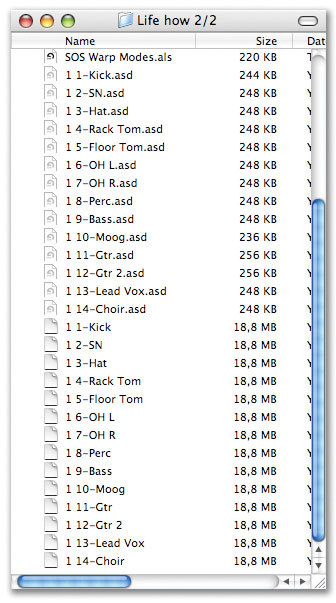 The resulting Consolidated Clips will be placed in your Live Set's Sounds folder. Obviously it only makes sense to use this feature if all the tracks to be re-quantised come from the same performance or have at least been recorded to the same basic timing reference. The idea behind a 'Warp template' is that you can set the Warp Markers for one Clip and have the all the other Clips follow those Markers — thus ensuring that the whole recording will stay together and perfectly in time with itself. This technique is also very useful for avoiding phase problems that might occur if there's any spill between tracks on a live recording. For my own track I have taken the hi-hat track from the recording I created for last month's article as the 'reference track' to work from. The hi-hat track seemed the most suitable because it had spill from every drum in the kit and it was therefore easy to see the waveform and set the Warp Markers appropriately. When you double-click on a Clip in either the Arrangement or Session Views you will see a waveform display on the bottom right of the screen that Ableton call the Clip View. To the left of it there is the Sample View window, and it is here that you set the method of time-stretching (Warping) you want to apply to the audio. There are five different modes to choose from: Beats, Tones, Texture, Re-pitch and Complex. Beats and Re-pitch are fairly self-explanatory, but it is worth spending some time experimenting with these modes to find what best suits the audio in question. For this more atmospheric section in the drum track the Complex Warp mode worked much better than the Beat mode used for the rest of the recording.In Beats it is important to set the Transients to the highest possible value, since this parameter can introduce unwanted rhythmic side effects if it is set to a smaller subdivision than the material requires. If there are no hits on even 16th values, set it to 8ths, if there are none on even 8th values set it to quarters. Tones is best used on simple, possibly monophonic audio with a clear pitch structure — vocals and most acoustic instruments. Texture lends itself to more complex, rich and layered sounds. The grain size in the Tones and Texture modes determines the size of the 'chunks' that are created to stretch the audio — similar to Stretch Cycles in Akai samplers or Granulation in Native Instruments' terminology. You need to play with these parameters to get a feel for what they do, but in general terms the audio sounds a little less effected by bigger values, with the trade-off being that you sometimes get audible loops for values that are set too high. Complex mode was designed to be used for composite (ie. mixed-down) material, it generally works best on audio that only needs gentle treatment. Beware though, since this mode can put some serious load onto the CPU. Sometimes it can be useful to alternate between modes even within the same take. For example, in the recording this article is based on there is a middle-eight section in which the drummer plays atmospheric cymbal swells, and the Beat Warp mode, which works very well for the main part of the track was introducing unwanted artifacts. This problem was solved by isolating the section into another clip, (select a section and use the Edit menu's Split command) and applying the Complex mode. It is always worth keeping in mind that it might not be necessary to Warp at all, and not using Warp will always result in better audio quality, not to mention being kinder to the CPU. Although the following can be done in the Arrangement View I find it easier to work in the Session View. The first thing to do is to insert the Consolidated 'reference track' (hi-hat in my case) into a Clip Slot in a new Live Set by dragging it from the browser. Open the Clip and Sample Displays by double clicking on the Clip. Using the Zooming Hot Spot underneath the Clip Display (a magnifying glass appears when you scroll over this area with the mouse) you can quickly locate and zoom into the first downbeat of the track. Enable Warping (I'll use the Beat Mode in this case as it's a percussion track) in the Sample Display window to the left of the waveform and you will see some grey Warp Markers appear. Double-click on the one closest to the downbeat (it will turn yellow) and drag it as close to the beginning of the transient waveform as you can get. Using the Context Menu (right-click on a PC or Control-click on a Mac) you can now Set 1.1.1 Here (see the screen at the bottom of the first page) to define the first downbeat of the track. Here the same Clip was copied into all the relevant Clip Slots. 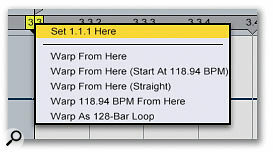 If you now drag other audio files of the same length into the sample display of each Clip View the Warp Markers (and all other Clip information) will be retained and applied to the new audio.The next bit can be a little time-consuming, depending on how tight the original performance was — the aim is to set Warp Markers as close to the transients of the waveforms as possible for the length of the performance, but don't worry because, given the 'Warp template', you'll only have to do this for one track. Before you begin it is best to set the Global tempo as close to the tempo of the original track as possible. Obviously if you recorded the track yourself you will know the original tempo, but otherwise (if you've been given someone else's track to remix for example) you can do this by listening to a section of the track and tapping the Tap Tempo button in the top left corner of the screen (this can also be assigned to a MIDI or Key Command using Apple/Control+M or K respectively). The Global tempo (and therefore Warping) will adjust to this tempo and this should be accurate enough to work with. Using the commands in the Context Menu to Auto Warp to the right of the downbeat as described above, you can get a pretty good approximation of what you need. I find that the Auto Warp algorithm is usually pretty good and that you only need to adjust the occasional Marker. Now you need to go through the Clip and move any Warp Markers that aren't precise enough for you. Live will only allow you to use a set of Warp Markers on a different Clip if the files are exactly the same size. This makes sense because the assumption is that you would only want to do this on tracks that were recorded at the same tempo, thus being the same length. You can check this easily by comparing file sizes in your file browser. To adjust Markers double-click them and drag them to the correct location. It's important to note that only markers that are yellow retain their position (are locked) when the Markers around them are moved, grey markers will only move in relation to the yellow markers as they (the yellow Markers) are moved, and remain equidistant to one another, creating an average tempo. You can check the timing by listening to your metronome or click track together with the corrected Audio Clip. Once you have finished going through the track and are happy with the results, the main bit of work is done. You are now ready to copy your 'Warp template' to all the other tracks you wish to treat. Copy and Paste the reference Clip into the Clip Slots of all the other tracks in the same Scene (the horizontal row of Slots), as shown in the screen at the top of the page. Now double-click on the first Clip and then drag the audio file that you want to place in this track (any of the Consolidated tracks you created earlier — eg. Kick Drum) from the browser into the Clip Display (the waveform display in the bottom right-hand corner of the screen) of the selected Clip. This will replace the sample but retain the Warp Markers from the template Clip. Rename the resulting clip to correspond to the sound. Repeat this procedure for all tracks, and when you trigger the whole Scene the entire multitrack recording will play back in time with the metronome. In order to recreate the original arrangement of the track you can record these Clips back into the Arrangement View. In the Session View, press Global Record and trigger the Scene that contains the corrected audio Clips. This will record the corrected tracks into the Arrangement View — you can stop before the end of the track and drag the right corners of the Clips in the Arrangement view to the end. Now you should be looking at something very similar to your initial recording — the important difference being that it is now quantised, and you can change the tempo and generally muck about with it. You may find that all the Warping is too much for your CPU to handle, in which case it is sensible to Consolidate all the tracks at the desired tempo. Before you do that though, make sure that your Warp settings (see the 'Warp Modes & Grain Sizes' box) are properly set up to achieve the best sonic results possible. It's also a good idea to save the Set under a new name before Consolidating, as the resulting files will then end up in their own folder. Once this is done you will have a collection of files that are all quantised to the same tempo and are therefore easy for the software to play back, since there is now no need for time-warping. One of the more unusual concepts within Live is that of the Audio Clip. At first glance it is easy to mistake it for a strangely named standard audio file — in fact the concept of the Audio Clip is at the centre of Ableton's software design. As in the famous painting by René Magritte (this is not an audio file, this is a picture of an audio file) a Clip is one representation of an audio file within a Live Set. Think of it as a container that holds the address of a sample, but only refers to it by reading it from the disk drive. Live treats all audio files as 'read only' files — all the manipulation of the audio is done in a non-destructive way, and the same sample can be the basis of a multitude of Clips that all sound completely different. Quantisation, tuning and any envelope-controlled manipulation of the data such as sample offsets are done purely by the CPU in software. Let's take the example of the Sample Offset Envelope. The individual hits of a loop are being played back in a different order to the original audio file without that original file being physically cut into component parts. Neither is a new file of the re-arranged playback order being written to disk. Live just reads the data in the order determined by the envelope. By using the same file with a different envelope you can achieve completely different results. The data that manipulates the audio is separate from the audio itself, so you can replace the audio of a Clip without touching any of the other Clip data. As we have seen in the main text, this can be very useful when you are dealing with multiple tracks of the same sound source or timing, as you only have to perform certain 'edits' (setting the Warp Markers for example) once. In this Live behaves much like a sampler, with the difference being that the data is being streamed straight from a disk rather than sitting in the RAM. If you want to rearrange the arrangement, you can do this by copying and pasting within the Arrangement View, much as you would in any other DAW. Of course it's also possible to add loops or other audio files from your collection in this mode, and if you're essentially just developing the arrangement you started with, this might be the way to go. However, for remix purposes you'll get the most out of Live if you chop the material and prepare it for use in the Session View. To do this you can make use of the fact that it is possible to copy a Clip between the two modes — the Session and Arrangement Views. 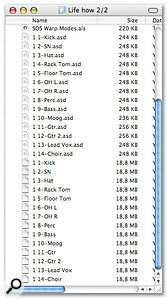 Here all of the drum tracks were selected and separated into individual Clips using the Edit menu's Split function. You can see the Start and End Markers of the Clip as flagged by the Software. The Loop had to be set manually, using the graphic Loop Braces in the Sample Display.Using the Arrangement View as the source of audio to select from and the Session View to collect snippets to be triggered and treated, you can quickly build up a totally different loop palette and arrangement. When you've started sequencing new material and combining it with other material from your library in the Session View you can always flip back to the Arrangement View to 'harvest' another sound bite from the original. To create a new Clip from an audio file, you need to set the Start Markers to the beat you want the Clip to trigger on. Although it is possible to do this within the Clip View window it is often easier to select the part in Arrangement View and use the Split command from the Edit menu (Apple/Control+E). As shown in the screen at the top of this page, the resulting Clip will have the Start Marker set to the beginning of the Clip, regardless of its position within the track. In order to make it loop you'll need to set the Loop Start and Length markers at the bottom of the Clip View window. To get the Clip into the Session View, all you need to do is Copy and Paste it into the desired Clip Slot. And if you apply the same method described above you can use the settings of one Clip across the whole multitrack recording. The same section of audio as before, Consolidated into a new Clip. A much faster way to separate out loops is to Consolidate the audio of the Split tracks in the selected area (as shown in the screen above), which can be done simultaneously for multiple tracks. You can then copy a selection of Clips across to Session View in one go. This has the advantage that Live writes new, smaller files onto the disk and these are easier to handle than lots of Clips all using the same audio file as a source. If you like working with smaller loops, this is the way to go. For long sections it is more economical just to use the Clips straight from the original audio file and adjust the Start and End Points, since Consolidation takes longer and uses up more disk space. Once you have collected and created enough material in Session View, you are in a position to quickly create a variety of arrangements, as we described in our first Live column a couple of months ago — and that takes the whole process full circle!